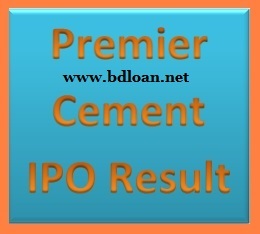 Premier Cement IPO Result published !!! Premier Cement Mills Limited is one of the leading innovative cement manufacturers in Bangladesh. It manufactures EUROPEAN standard product using the best raw materials and technical excellence for ensuring dependability and superiority of cement. The products provide strength and durability to buildings of high dimensions, roads, bridges, infrastructure that speeds the lines of commerce, and for housing that provides comfort and security to families across Bangladesh, India, Myanmar, etc. The name Premier Cement is known as one of the topmost brands in Bangladesh. Its associated companies adhere to the same demanding standards as they provide to Government, Builders, and Manufacturers of construction materials such as Ready Mix Concrete, Block, Pipe, and other pre-stressed concrete units. Premier Cement enjoys a sustaining reputation and good history in Bangladesh. It has the experience to excel on one of the top positions in the market consistently. Premier Cement IPO Result Published. 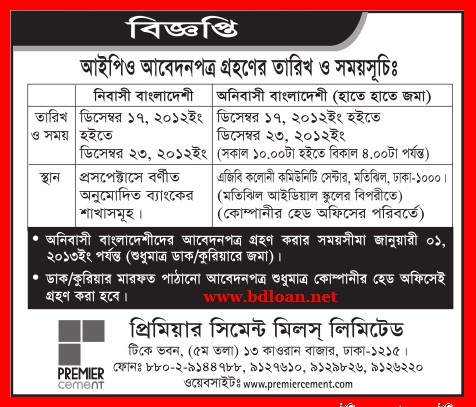 IPO lottery of Premier Cement Mills Limited will be held on 20 January, 2013 Sunday, at 10:00 a.m. in the Seminar Hall of The Institution of Engineers (IEB), Ramna, Dhaka-1000, Bangladesh. Premier Cement IPO Result, the Premier Cement IPO Result published on 2o January 2013, Sunday at 10.00 a.m. in the Seminar Hall of The Institution of Engineers (IEB), Ramna, Dhaka-1000, Bangladesh. IPO Lottery Result of Premier Cement Mills Ltd. from www.premiercement.com.of Premier Cement IPO Result. IPO subscription of Premier Cement was re-scheduled which will continue from 17 December 2012 to 23 December 2012 (both days inclusive). For Non-Resident Bangladeshi (NRB), subscription will continue till 01 January 2013. Offer price of the share is Tk. 22 each including premium of Tk. 12. Each market lot contains 200 numbers of shares. The company will raise Tk. 264 million by issuing 12 million Ordinary Shares through IPO with an aim to expand its production capacity. As per audited financial statement for the year 2010-2011, the company’s basic Earnings per Share (EPS) were Tk. 4.05. Alliance Financial Services Limited is the issue manager of Premier Cement Mills Limited. ● US Dollar 1.00 = 80.7000, FC Required for 200 Shares 54.53 US Dollar. ● UK Pound Sterling 1.00 = 130.0771, FC Required for 200 Shares 33.83 UK Pound.